VMFA-314 Black Knights currently base in MCAS Miramar flies the F/A-18 Hornet . The Squadron was form back in 1943 flying F-4U Corsair as Bob Cats. They proceed to fly F-9 Panthers and F4D Skyray. Deployed on USS Valley Forge CV-45 on the brink of Vietnam war on their F-4B Phantom and flew more than 25,000 combat hours in Southeast Asia. 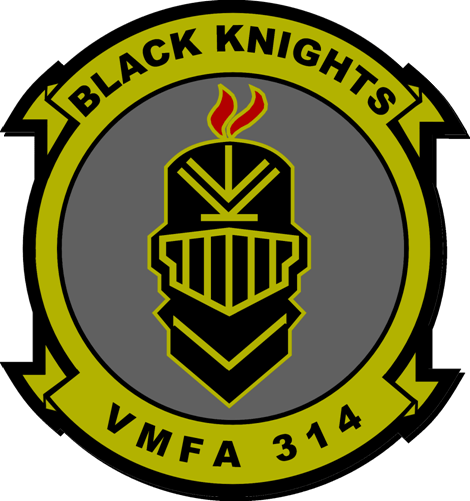 ON the Modern Era, Black Knights was the 1st Squadron in the Marine Corps and Navy to receive the F-18 and began her life in CVW-13 on board USS Coral Sea CV-43. She was later transferred to CVW-11 o CVN-72 in the 1st Gulf War. ON war on terrorism, she was deployed again on USS Stennis under the the arms of CVW-8. Black Knights holds the tail code VW and NG which lands them on the West Coast Squadrons.